This story came in after Carol spotted her grandfather, James Russell, in the Kurri Kurri Mandolin Orchestra photo that featured in the Coal and Community project. James is circled in the picture below. 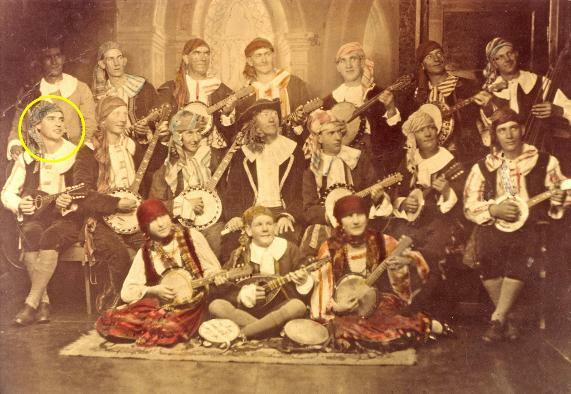 Kurri Kurri Mandolin Orchestra, [c 1930s]. From the Newcastle and Hunter District Historical Society archives held by Cultural Collections at the University of Newcastle, Australia. James Russell was born in Newcraighall, Midlothian, Scotland on 29th April, 1909. He was the youngest of Charles and Margaret Russell's eight children [5 boys & 3 girls]. Charles and his five sons all worked "down the pit" in Scotland. The youngest of the sons William [Bill b. 1907] and James [Jim b. 1909] began working in the pit as wheelers when they were about 14 years old. Charles had very definite ideas about working conditions in the mines and if the conditions or pay didn't suit, then he would leave one pit and move on to another taking his five sons with him. They worked in the coal mines in the Edinburgh/Lothians area. Jim's elder brothers, Charlie, Adam and Harry  enlisted to serve in WWI as did his brother in law George Murray. This had a deep and profound effect on Jim as he recalled later in life that he heard George, on leave at the time, tell Charles [snr] that he would not be coming back from Europe again as where they were sending him they were "killing them like flies". George Murray was killed in Europe survived by his wife Margaret [Jim's eldest sister] and their three children. After WWI Jim's brothers wanted to emigrate to Canada and work in the coal mines there, but their mother had a brother living in Kurri Kurri, NSW, and she asked them to go there instead. Jim's sister, Mary, emigrated to New Zealand with a group of young ladies who were going out there to become domestic servants. In 1921 the brothers left Scotland bound for Australia. They encouraged the rest of the family to follow them and when Jim was sixteen years old  the rest of the family emigrated to Australia. They travelled aboard the Themistocles which was a steamship. As they passed through the English Channel, the waves were not the only things heaving. The family was able to recover enough to enjoy the Bay of Biscay as the weather and seas were calmer. After a while Jim began to grow bored with the casual life at sea and was soon down in the engine room shoveling coal. When the Themistocles docked in Cape Town, Jim was amazed at the sight of scores of men engaged in manually bunkering coal and loading other cargo onto the ships. "It was like a human conveyor belt. One after the other they carried baskets of coal on their shoulders and tipped them into the hold, then off down the gangway to reload." The family arrived in Sydney mid-February, 1925. They had to wait until after dark to take the train from Central Station to Kurri Kurri. Jim says this was because Adam didn't want them to see what they had come to but perhaps he had wanted them to see that Kurri Kurri had street lights [recently installed]. The family bought a house, 200 Maitland Street, Kurri Kurri. They were packed to the rafters – Mum and Dad, Adam, Charlie, Harry, Jenny, Bill and Jim; and George, & grandchildren Peggy and Charlie Murray – three generations. Tragically Jim's mother, Margaret, died in September of the same year of perniscious anemia which is curable today with a vitamin B12 shot. Jim and workmates. Submitted by Carol Tickle. Once settled, the men of the family all went back down the pit to work and they worked in various pits in the Cessnock area. During a lockout at the pit [Aberdare, Abermain and Pelaw Main, February 1929] Jim and his mate Ivor Burton went to Toronto to look for work and they lived in Blackalls Park in a tent and showered under the cold shower. Jim said Harold Turner, the baker kept them in bread and stopped them from starving. It was in Blackalls that he met his future wife and they would go on to live in Kurri Kurri and have two daughters. 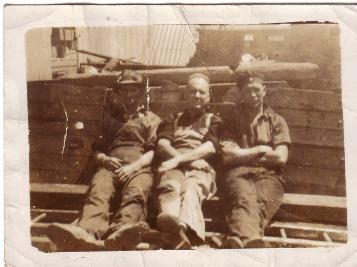 The brief period of time that Jim was out of the pit, he was shoveling coal at Zara Street Power Station in Newcastle. Topside, in their leisure time there was music. Jim could play the bagpipes. He also learned to play the mandolin, banjo and piano and played in a concert band in and around Kurri and later in Toronto when the family eventually moved to Blackalls Park to live. 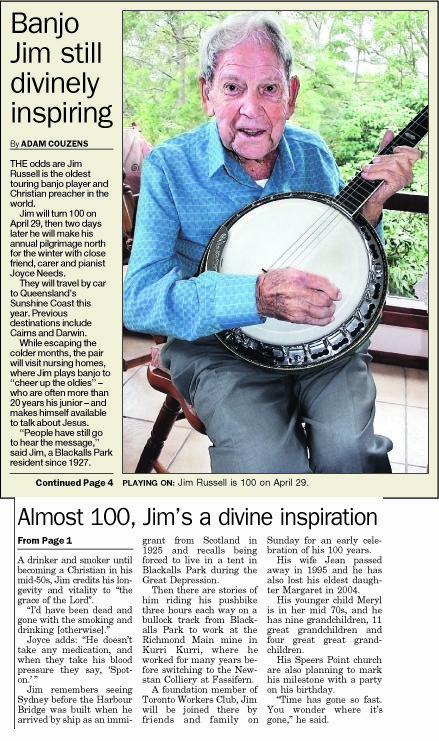 Jim became a Christian in 1964 and instead of playing music in clubs and at dances he played in churches and nursing homes. Miners and mineworkers moved around various pits depending on the availability of work and they regularly moved house as renting was very common in the 1930's among the working class. Jim said they moved so often that the chooks would lay on their backs and put their legs in the air if a truck went past. Eventually Jim worked at Newstan colliery from which he retired. He enjoyed a long and happy retirement and made many friends. He travelled north every year for the winter in his later years and continued to do so right up the year he passed away. He lived to celebrate his 100th birthday with his large family and many friends and was blessed to keep his mental faculties right up to the end. He was still able to preach in church in his 100th year. He passed away peacefully in his sleep in October 2009. Clipping from the Lake News . Submitted by Carol Tickle.